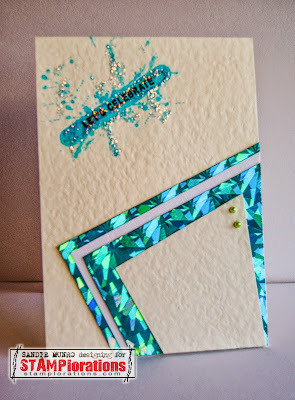 I have used the 'Holiday Artsy' stamp set from STAMPlorations and added some sparkle for a real celebration! For this challenge our Guest Designer is the very talented Carol. I have been following her blog for a while now and do love her creativity. If you don't know her then I urge you to visit her blog here and be inspired! Sandie, your card is sheer delight! The artful 'sparkle' on the top, paired with the angled papers on the lower half are not only eye-catching and striking, but such a unique interpretation! Pretty and most definitely 'celebratory'! I'm quite loving this!! The glitter is fantastic! Happy Monday. A clever take on a tricky sketch, the colors give this card a cool look! Oh this is so funky and fun Sandie...super retro! Looks like a tricky sketch but you did a good job with the sketch! Love ur awesome take on this sketch. Looks so stunning!! Great adaptation of the sketch, Sandie. And what, no purple?? Yep, tricky sketch ;) Love how you used the PP frames in the lower corner.